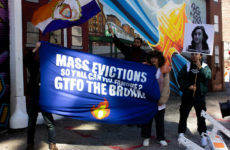 The South Bronx Independent Artists Coalition joined forces with both local and international artists to present the first South Bronx Open Studio Tour on Saturday, May 19, opening the doors to artist studios and galleries across Mott Haven and Port Morris. Young artists from the borough contacted Johnson because they felt like they did not have a presence in the art world. Johnson, who is the exhibitions coordinator for the South Bronx Independent Artists Coalition, took action and came up with the South Bronx Open Studio Tour. The tour included galleries such as Wall Works, BronxArtSpace and open studios of 34 artists. The event was from noon to 5 p.m. and was sponsored by Charlie’s Bar and Kitchen, BronxArtSpace and Port Morris Distillery. The newly formed South Bronx Independent Artists Coalition was founded this year and includes several artists who work in Mott Haven and Port Morris. 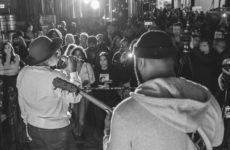 Their mission is to connect with other artists from South Bronx and promote their work as a collective. Guests visiting BronxArtSpace during the opening of In Broad Daylight. WallWorks’ latest exhibit, Rush Hour, the second solo show for German artist Claudia “MadC” Walde, opened the same day as the tour. The large-scale abstract paintings use a contrasting palette of dark colored strokes and brighter colors such as neon pinks and yellows. All of her works are in various sizes, some as large as 4 x 3 feet. The show will be up through June 20. The gallery aims to get the community involved by keeping doors open to both openings of shows and the exhibitions that follow. “The crowd is always different depending on the artist, but we also have a core group of locals who come to the show and they usually ask the best questions to the artist because they have not been jaded by the art world,” said Matos. A few blocks over on Alexander Avenue, artist Blanka Amezkua exhibited her solo work at her gallery, AAA3A. “Today is a great idea because there are so many artists living in the South Bronx. We also get to know each other, which is great for artists,” said Amezkua, who was lived in the Bronx for 13 years and teaches art to seniors in Manhattan. Around the corner from her exhibit, Amezkua helped curate In Broad Daylight, a show featuring several female street artists from Greece, at BronxArtSpace on East 140th Street. Guests visit the open studio of artist Maria Scarpini. “Considering a lot of the turmoil and difficulties Greece has been going through, I think the artist can relate to a lot of what’s happening in the Bronx because a lot of it is the same,” said Amezkua. 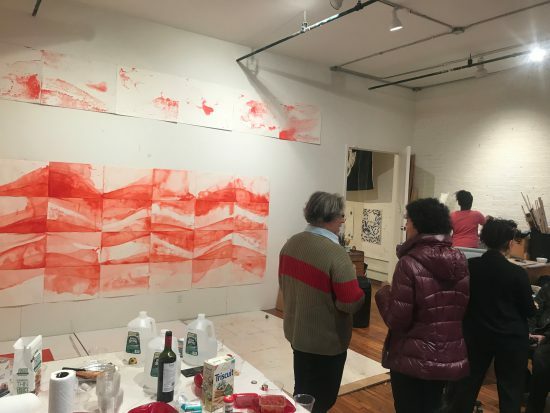 Other artists included in the tour were abstract painter Patrick Alston and painter Sarah Sagarin, who were included at the gallery 605 E. 132 St. Italian artist Maria Scarpini, who opened her studio in the back of BronxArtSpace, exhibited large red paint strokes on paper. Some artists like Johnson turned to the Bronx for open studio space at affordable prices, while others like Amezkua originally came for career opportunities. No matter what the reason, all of the artists in the Bronx agree that the borough has a lot to offer and deserves more recognition. 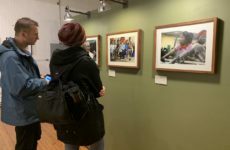 The day concluded with a ceremony for the pop-up exhibition at 37 Bruckner Blvd., where Johnson and other artists were exhibiting their work. The party continued at Charlie’s Bar and Kitchen on Lincoln Avenue. Many of the shows opened during the tour will remain on display through June. To find a full list of the participating artists and link to the shows that are still open to the public, visit https://www.dontcallitsobro.com.